Designed to drop big bucks with authority. 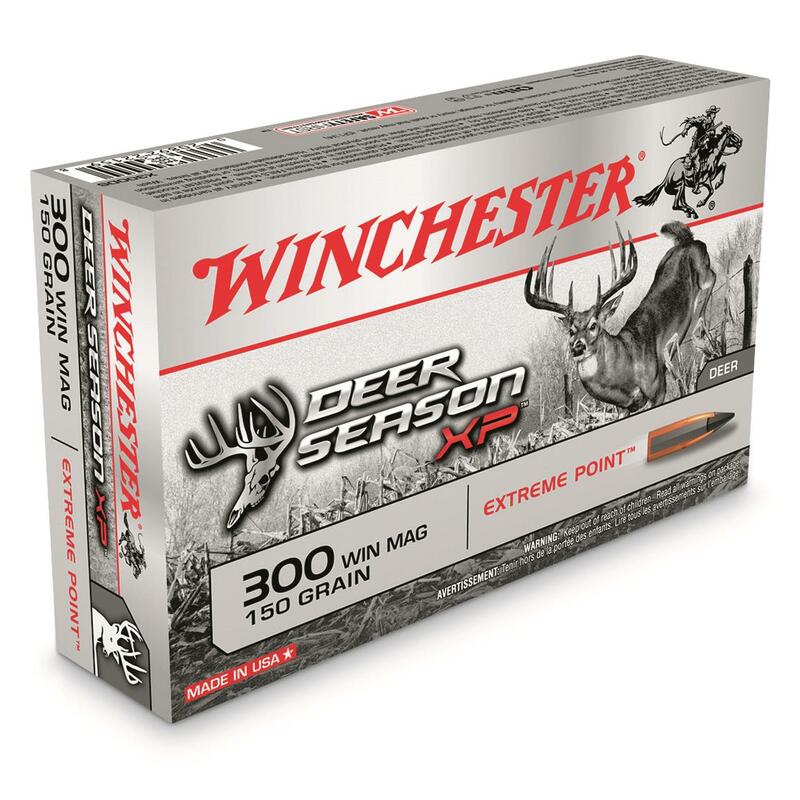 Built for big bucks, Winchester® Deer Season XP® delivers massive knockdown power like no other polymer tip. The Extreme Point bullet features an oversized impact diameter, delivering greater impact trauma, better energy transfer, and larger wound cavities for faster knockdowns. If it's brown, it's down. 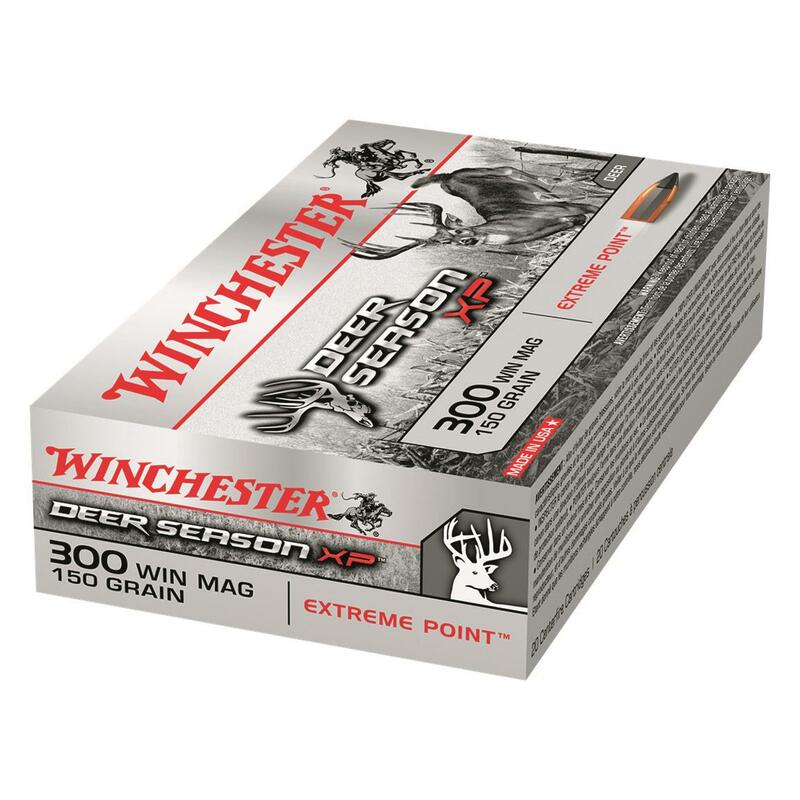 Winchester Deer Season XP, .300 Winchester Magnum, Extreme Point, 150 Grain, 20 Rounds is rated 4.3 out of 5 by 44. Rated 5 out of 5 by Lumpy64 from I love them! Dropped every deer I shot with them! 15 yards to 250! Rated 5 out of 5 by Billy Merganser from Accurate, Reliable, Effective I have used these cartridges in two 308 bolt guns over the past 2 seasons. They are very accurate and I have had no misfires from the 30 or so that I’ve shot. I’ve taken 4 whitetail with them at ranges of 80, 105, 296, and 266 yards according the range finder; 3 of those deer didn’t take a step after the shot and one ran about thirty yards before collapsing. By far the best performance I’ve experienced on whitetail. Rated 5 out of 5 by scas from Multiple calibers, no issues. I use the Winchester Deer Season XP in all of my Browning's .300 win mag, 30-06, .308, 25-06 and .243. I have never had an issue of misfire, feeding or ejecting out of any of the Browning, TC Venture or my other bolt or lever guns. Over the past 2 years I have used this ammo exclusively, and my family or I have not lost a deer yet, because they drop in there tracks 95% of the time. The ones that do travel go a max of 20 yards. I used to use Hornady all the time, and have no problem with Hornady. I just love this round. Its extremely accurate, holds a tight pattern and it is consistent in every gun, every time. I am stoked to see this in 30-30, and if it is released in .35 Rem and 45-70, I will be getting it for bear and as a brush round. Rated 5 out of 5 by Hunter34 from Excellent Penetration Excellent bullet and could not be more happier with how it performed. My .270 win is very accurate with this bullet and have taken several deer with it. This year I used it for my Bull elk hunt and got a nice 5x5 at 330 yards. One shot to the chest and he didn’t go 10 yards before he dropped. Very accurate and hard hitting bullet. Rated 5 out of 5 by Nickname* from Heavy hitter Great product.Shot a 15 pointer with my 308 150gr during rifle season at 40 yards and he didn't go 50 yards. 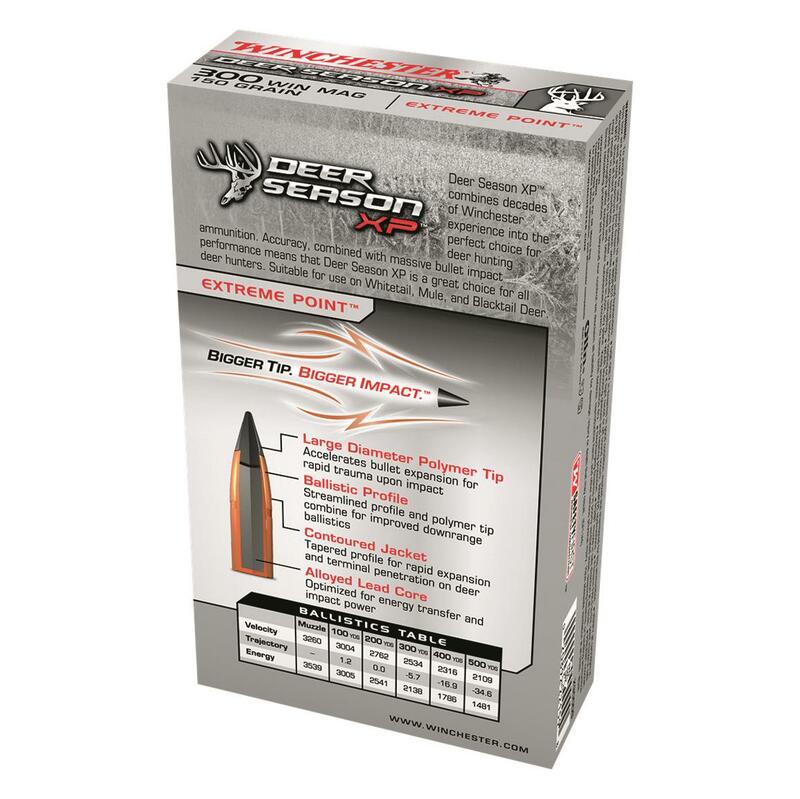 Rated 5 out of 5 by Billy from Outstanding Round First season using the Dear Season XP Extreme Point, and the first deer in my scope this season as well. This round took care of business even at a close range shot of 75 yards. Shot was right on the money! I got a pass through but he did not go far (45 yards).